The Los Angeles County Board of Supervisors has appointed current Los Angeles County Treasurer, Tax Collector and Public Administrator Mark Saladino as County Counsel. In his most recent role, Saladino was responsible for the oversight of over 450 employees and for the management of the County’s finances, including the receiving, investing and disbursing of County funds, as well as billing and collecting property taxes, business regulatory fees and a variety of debts owed to the County. Saladino is an ex-officio trustee of LACERA’s Board of Retirement and Board of Investments, an extension of his role as the Treasurer and Tax Collector of Los Angeles County. He has a legal background and extensive experience in management, finance, investments, and treasury-related issues. • Principal Deputy County Counsel, specializing in the areas of finance and investments. • Successful private practice at Hawkins, Delafield & Wood in New York City and at Jones, Day, Reavis & Pogue in Los Angeles. • Public speaker on topics related to public finance and investments for the California Association of County Treasurers and Tax Collectors, the University of Southern California, the University of California, Los Angeles; the National Association of Bond Lawyers; the California Debt and Investment Advisory Commission; and the California State Association of Counties. • Drafted California legislation regulating certain sales of local government securities. • Testified on securities issues to the California Legislature and the United States Congress. • BS, with high honors, University of Illinois. • JD, New York University. • Admitted to practice law in New York, California, and the District of Columbia. Los Angeles County Board of Supervisors Chairman Don Knabe announced the installation and launch of electric vehicle charging stations at various County facilities for public use. Electric vehicle owners headed to certain County destinations will be able to charge their vehicles for up to four hours, free of charge, during the initial year of the program. Currently, there are over 20 electric vehicle charging stations at facilities across the County, with additional stations planned for installation in the coming months. Parking rates and restrictions may apply at certain facilities. For an interactive Google Map of all current EV charging stations in LA County, please visit: bit.ly/evchargers. “Today’s vote marks the final step in a months-long approval process, with reforms agreed to by labor leaders, County management, and the Los Angeles County Employees Retirement Association Board of Retirement and Board of Investments. The County of Los Angeles has once again received the highest short-term ratings from the nation’s leading credit rating agencies. As an added benefit of these outstanding credit ratings, the County also secured record-low borrowing costs this week, ultimately resulting in more money being available for public services and community programs. Since 1977, the Board of Supervisors has authorized the annual sale of Tax Revenue Anticipation Notes (TRANs) to assist with short-term cash management. This temporary borrowing program is necessary since the County receives certain revenues, such as property taxes, unevenly throughout the year. In connection with the sale of the 2014-15 TRANs, the County recently received the highest short-term ratings from each of the three major credit rating agencies. Fitch Ratings, Moody’s Investors Service, and Standard and Poor’s assigned ratings of F1+, MIG 1, and SP-1+, respectively. Each of the credit rating agencies cited the County’s improving financial condition, fiscal discipline and conservative management practices as positive factors in making their ratings determinations. As an added benefit of these highest-possible ratings, the County is able to secure lower interest rates when borrowing money needed to temporarily finance operations. The $900 million of TRANs notes sold by the County this week were secured at a record-low borrowing cost of 0.12-percent, which is more than five basis points lower than the County’s prior low record of 0.174-percent achieved last year. With a goal of improving service results and reducing public spending, Los Angeles County Supervisors Don Knabe and Mark Ridley-Thomas are looking to launch “Pay-for-Success” financing for County programs. Pay-for Success is a concept where government pays service providers only if results are achieved. Rather than the traditional look at number of clients served or services provided, results are measured by prevention and outcomes. In some models, private financing is used to fund the program so that program risk is not held by taxpayers; however, if the program is successful, then investors may receive a modest return on their investment. In a motion presented today by Supervisors Ridley-Thomas and Knabe, they asked for the County’s Chief Executive Officer to convene an advisory group of external Pay-for-Success financing experts to work with county officials to develop guidelines to launch Pay-for-Success programs across county departments. Within 90 days, they requested a financial and operational blueprint for selecting and executing the Pay-for-Success concept. Through the Pay-for-Success model, started in the UK and launched in the US in New York City, private sector innovation is used to improve outcomes for constituents, while also realizing savings for the public. 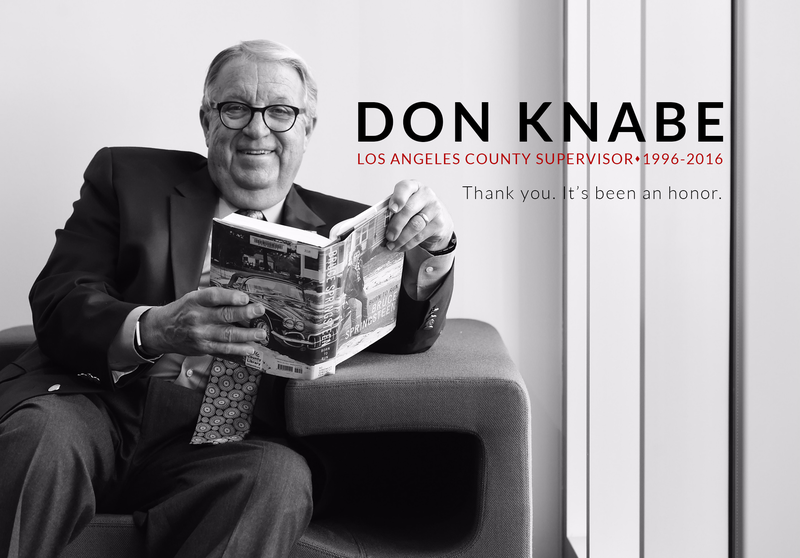 On a motion by Supervisor Don Knabe at today’s Board of Supervisors meeting, Los Angeles County will review its current military leave policy for County employees to ensure they do not lose any opportunities or seniority while on deployment. Currently, in order to protect reservists and their families from loss of income and benefit coverage during deployment, the County makes up the difference, if any, between a reservist’s military pay and their County pay for up to 720 days. The Chief Executive Officer will review the County’s current policy and report back within 60 days. Pending the receipt of recommendations, the Board can vote to suspend the current 720-day limit policy. The Chief Executive Officer will also report back on options to ensure that County Employees receive their seniority rights and privileges as well as report on efforts to develop a County-Wide Military Leave Coordinator.